Brussels sprouts grilled cheese? Yup! 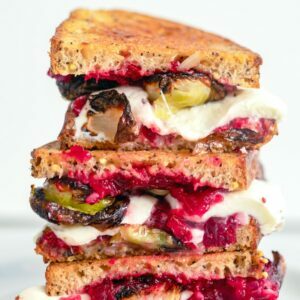 This Brussels Sprouts and Cranberry Relish Grilled Cheese is the perfect solution to Thanksgiving leftovers. But it's also incredibly easy to make from scratch for whenever the craving hits! Heat 1 Tbsp olive oil in a medium saucepan over medium-low heat. Add onion, ginger, and garlic and cook until onion and garlic are softened and fragrant. Add cranberries, sugar, and water to the pot and bring to a boil. Reduce the heat to low and simmer for about 15 minutes, continuing to stir. Berries will start bursting and mixture will get thick. Remove from heat and spoon relish into a bowl to cool. While cranberry relish is cooking, prepare brussels sprouts. In a medium bowl, combine brussels sprouts with remaining 1 T olive oil and salt and pepper. Lay brussels sprouts out cut side down on a foil-covered baking sheet. Bake for about 25 minutes, until nice and crispy. Spread butter on one side of each slice of bread and place on a griddle or skillet over medium-low heat, butter-side down. Spread a thin layer of cranberry relish on top of each slice of bread. On top of two slices, layer roasted brussels sprouts and then add mozzarella cheese. Put bread slices together and grill on each side for a couple minutes until the bread is browned and the cheese is melty.